This week I'm delighted to present an interview with pre-Shortzian (and now Shortz-era!) constructor Eileen Bush Pazos! On June 22, 1969, Eileen published the amazing "Space Madness" puzzle (which I featured on September 6, 2013) commemorating man's landing on the moon. Her second submission was rejected by Will Weng, and she began making crosswords for corporations and her hometown newspapers. Recently, after a 10-year hiatus from constructing, she built another puzzle and submitted it to The New York Times. Although the puzzle wasn't accepted, Will Shortz thought I might be interested in talking to Eileen. I definitely was, and her story is fascinating! To read the interview, click here or on the Pre-Shortzian Constructor Interviews tab above. Thanks so much again, Eileen and Will! We're now into June, and we have a new Litzer of the Month: Brian Kulman! Brian is a solver and rock climber who has made an intriguing analogy between crossword solving and bouldering! To read more about Brian, click here or on the Litzer of the Month tab above. Her family lived in a town called Wenham, MA where her father worked as an "inventor" at a machine shop. "Inventor" is the best I could make out, but he was salaried, so not just an apprentice or low-level worker. Her father Bernard immigrated to the US from Canada in 1891, her mother Bertha also came from Canada, about 1890. The were naturalized in 1916. I know she married David Johnson, who died before her, but not much else there. More interesting, I have two passenger records for her. One in 1932 (when she was 19) sailing from LA to NYC. She was traveling alone. A second one in 1935 from Boulogne, France to NYC, also traveling alone. Both were under Leveque, so she hadn't married yet. I have a WW II draft card for him, at that time (1940) he was living in Hickory, NC, where he was a teacher at Claremont Central High. The school actually has its own Wikipedia page. . . . I'm not sure exactly how he came to work at Oak Ridge as a "health physicist," but you have to remember Oak Ridge was a top secret facility in WW II. . . . I found a family tree at Ancestry.com that includes him, and shows he had two sons. . . .
[A]las, the story pretty much ends there. I don't even know if Fox is her married name or maiden name. Nevertheless, I can tell you she was born 9 Jul 1911. [H]e was born Stafford Palmer Osborn 13 May 1923 in Nice, France to American parents. He served in the military during WW II (at the time he enlisted he was manufacturing autos), after the war he went into the silversmith business near Boston. With this, and some luck, I found his obituary. It's only a preview, the original is from the Boston Globe . . . and behind a paywall. . . . Even better, I managed to find another article about him . . . from 1957! With a picture!! According to Bramesco & Lasher, he didn't get into crossword constructing until 1972, then became rather obsessed with it and gained rapid success. So it's pretty neat to have an article about him from 15 years before that all happened. I know Alvin Ashby has had at least 1 puzzle in the NYT (11 Oct 1942). I also knew he was from Utah because it was mentioned in the S&S 75th anniversary volume. 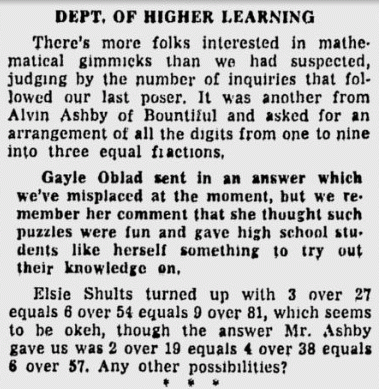 I also found a couple of articles online mentioning math games by an Alvin Ashby of Bountiful, which is in Utah. Those were in 1956. I found several of his puzzles online, starting in 1932 and going until 1973. Well, Ancestry[.com] points to one person named Alvin Jordan Ashby who was born in Taylorsville, UT in 1901 and died in Bountiful in 1979. I found records of him in the 1910, 20, 30, and 40 census. I found other information in sources about where he lived and what he did. And with some nice sleuthing and more than a bit of luck, I found an obituary for this man. There's just one little problem: not a bit of this biographical info mentions anything about crosswords or puzzles, which seems very odd given how many Mr. Ashby created and for how long. I only found 1 other person with a similar name in this locale, and I'm pretty sure it isn't him. This guy fits in terms of dates, but his main occupation was a farmer. But he was also a high priest and secretary of the local ward, and the picture of him sports glasses. I think this is our man . . . but it's frustrating that I can't make the connection. Possibly I could find someone who knew him (he married but appears to have had no children). 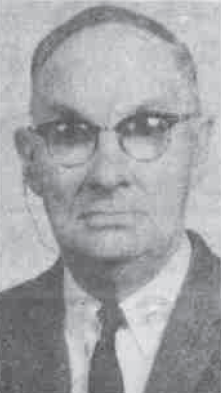 Further research turned up another article on Alvin Ashby, making that connection between the farmer and the crossword constructor. Thanks again for all this great research on pre-Shortzian constructors, Todd! Thanks for the mention of Threba Johnson! She was one of the first members of the Fairfield County Puzzlers League--and I had completely forgotten her existence until the mention above. Have you ever had anything here about the FCPL (founding members: Will Shortz, Doug & Janis Heller (now Janis Weiner Schmalzbach), Norton & Anne Rhodes, and myself). I don't remember if Threba came to our first meeting, but she was a steady customer after we got rolling. I think the League still exists in some form and in some other NYC environ. This was way back, when even Will was Pre-Shortzian!